Don’t forget to mark your calendars! The theme is "Energizing Employee Ownership," with keynote speaker Rich Armstrong who is the President of The Great Game of Business. ESOPs and employee-owned cooperatives share many similarities as well as differences, and each model can provide a distinct set of features for a business and their employees. Some businesses have found that each model has not been “enough”, and have taken parts of each to create something new – the “ESOP-operative”. So how would such a hybrid work? This two-part webinar series will help outline how its done, what to look for, and watch out for, as well as a case study from a company that has made it work for them. 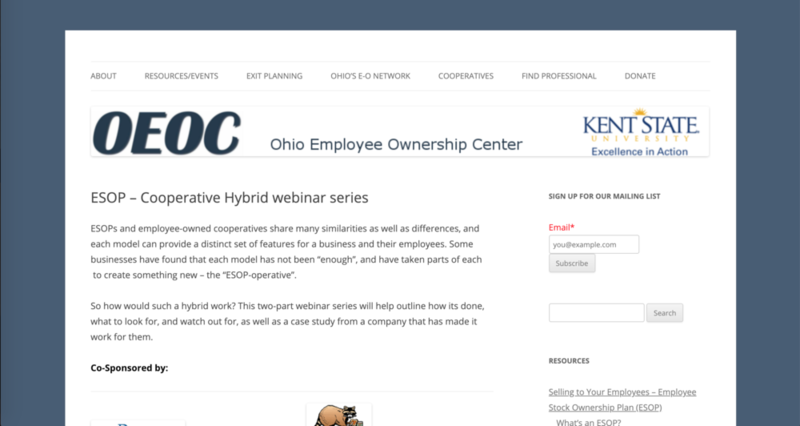 Webinar One: The ESOP-Employee-Owned Cooperative Hybrid, Thursday February 21st, 2019, 2:00 pm EST – Presenters: Chris Cooper, OEOC (Moderator); Deborah Groban Olson, Attorney, and Founder of the Center for Community Based Enterprise; Bob Gelser, General Manager, and Scott Owens, Board Member and Employee Owner, Once Again Nut Butter Collective, Inc.
Webinar Two: The Role of the Trustee and Governance in an ESOP-Cooperative Hybrid, Wednesday March 13th, 2019, 2:00 pm EST – Presenters: Chris Cooper, OEOC (Moderator); Peter Jones, Horizon Trust & Investment Management. These webinars are provided free of charge with support from the USDA’s Rural Cooperative Development Program. If you would like to support the OEOC’s continued work in this area, you can do so here. We need your input! Please join us for an Owner Update & Input Meeting. We’ll be updating everyone on the property & funding status and asking for your thoughts on fundraising plans. “For the Love of the Community” Valentines Party and Raffle! What: 120+ guests attend an exclusive evening at the Phoenix Ballroom. Includes a buffet, drinks, and entertainment. Speakers will share about the work of Community Shares and our Member Organizations. Purpose: To support non-profits working for local advocacy, justice, and equality initiatives in Greater Cincinnati. To raise awareness and support for Community Shares. If you would like to be a SPONSOR to this event, please email us at mdillingham@cintishares.org! The screening is sponsored by CODE Credit Union. Through interviews with employee-owners, Shift Change shares the stories of cooperative businesses across the U.S. as well as the Mondragon Cooperative Corporation in Spain. Featured co-ops include Evergreen in Cleveland, OH, Isthmus Manufacturing in Madison, WI, and Prospera in San Francisco, CA. Join us as we celebrate the continued success and journey of Cincinnati Union Co-op Initiative and Union Cooperatives! Evening will Feature: Tasty tapas and happy hour featuring produce from Our Harvest Cooperative, meet & greet with union cooperative members, music, split the pot, inspiration and tons of fun! Want to give us deeper support? Become an event sponsor or a sustaining partner! Please call (513) 549-3381 if you have any questions or need further information. Thank you for your support! As members of People for Early Childhood (P4EC) coalition, CUCI invites you to join us for a forum on early childhood education as a tool for racial and economic justice -- past, present and future! Lessons Learned: Race, Class, and Early Childhood, Saturday November 10, 2018 at Tryed Stone New Beginnings Church 5550 Reading Road Cincinnati, OH 45237. During this forum we will discuss the radical history of early childhood education and how preschool can serve as a tool for racial and economic justice. Free snacks, childcare, and free parking is available. Event details here. See you there!! If you are like most of us and feeling overwhelmed about the state of the world, then you will want to join us to discover practical ways to create “really deep change” as Sarah van Gelder describes it. Sarah van Gelder, co-founder of Yes! Magazine, traveled 12,000 miles across the United States in search of hope. What she learned inspired her to write a book, “The Revolution Where You Live: Stories From a 12,000 Mile Journey Through a New America. What is so very exciting about this book is that it includes a section on our very own CUCI. Yes, Cincinnati was one of her stops! Equally exciting is that Sarah will be coming to Cincinnati to talk about her wonderful and hopeful discoveries that spurred her to write such an optimistic book. Come and gain new insights and be inspired! We look forward to seeing you and catching up with our CUCI community! Save the date for the Worker Co-op National Conference this September where worker cooperators, unions, developers, allies, funders, investors, and visionaries gather in Los Angeles, California to make space for connection, education, skill-building, and sharing, for worker-owners and allied leaders who work to improve the lives of workers and their families. On June 22-24, 2018, over 700 people across the new economy movement will come together in St. Louis, MO for CommonBound 2018 to connect with one another, share our resources, and demonstrate our power in creating systems that truly meet the needs of our communities. In past years, CommonBound has answered the questions of what is a new economy, why do we need one, and who is it building it. Next June, CommonBound will connect these threads and focus on another question: How do we build a new economy? Learn more and register here. Together, we can make CommonBound a conference that propels our movements forward. In 2018, the Midwest Regional Sustainability Summit will continue to explore new and promising areas of environmental sustainability, while also taking a deeper look at the issue of resilience. Be part of the solution: help our region's leaders move Greater Cincinnati's sustainability and resilience planning to the next level! Are you a current childcare professional or someone who wants to get into the field who is interested in earning a living wage while caring for only 3-4 kids at a time? Are you a parent who wants quality, affordable, personalized childcare for you kids in a flexible home setting? Do you currently own a childcare business and want to find ways to decrease costs, expand your market, and improve quality all while increasing your profitablity? SAVE THE DATE - February 24Working People's Day of Action! As you know, the U.S. Supreme Court will hear oral arguments on Janus vs. AFSCME on February 26. This is the third time the U.S. Supreme Court will hear a case involving the “fair share fee” requirement — quite obviously politically motivated. It is essential that all unions and working people understand that although this case is a direct attack on public sector unions it is a broadly designed attempt to silence all workers and our pursuit for economic and social justice. We must make a big statement here in Ohio, one that requires all unions to mobilize so that our message is heard here at home, in Washington, D.C. and at the Supreme Court. So, please... mark your calendar for Saturday, February 24 for A Day of Action event in Columbus. Details and logistics are in the works, which we will share with you shortly so you can help us achieve our turnout and messaging goals. “For the Love of the Community” Valentines Party! CUCI's fundraising and community justice collaborative partner hosts their annual fundraising event at the Phoenix Hotel downtown! Join us and over 20 other non-profits working for local advocacy, justice, and equality initiatives in Greater Cincinnati. Creating an Economy that Works For All Party! We hope you can join us for a party on Friday, December 1st with tasty tapas, music, and more! On Dec 1st & 2nd people from all across the U.S. and from Mondragon, Spain will be gathering in Cincinnati to further develop the union co-op sector of the U.S. economy. The Symposium offers a look at what's happening on the ground to establish integrated networks of worker-owned, unionized businesses. Participants will discuss best practices, union co-op management, financing, training, the power of the union co-op model, and how to build an economy that works for all, and more. Check back for more details in the coming months! The first platform cooperativism event in 2015 popularized the #platformcoop idea, and the second event in 2016 brought together co-op and union leaders to push the model forward. This third event will zero in on ways that platform cooperatives can help to address some of the future’s most urgent challenges. The fairer digital economy we need is already emerging, but it won’t happen on its own. That’s where you come in. Share your expertise and enthusiasm! Join a committee: Events, Fundraising, PR/Marketing, and Outreach. Volunteer as much or as little as you’d like, we appreciate the help! Renting Partnerships is seeking people to help us unleash our potential for building the assets of people who cannot afford to buy a home. Join us at our Bahr Farm, 969 W. North Bend Rd., Cincinnati. Meet Stephen Dienger, farm manager, at 9AM for a 30 minute tour. From 9:30-noon volunteer and see what farming is all about! We'll have ways the little ones can help too! Join Apple Street Market in exchanging information on how Apple Street Market and our communities benefit each other. And get the latest progress on our timeline for construction and opening! Join us at Bahr Farm, 969 W. North Bend Rd., in Cincinnati. Meet Stephen Dienger, farm manager, at 9am for a 30 minute tour. From 9:30-noon volunteer and see what farming is all about! We'll have ways the little ones can help too! RSVP to megan@ourharvest.coop. Come to the June weekly meetings on the 6th, 13th, 20th, & 27th! Passionate about food access and the Apple Street Market Co-op? Come to their weekly volunteer meeting! Topics vary from week to week. In 2017, the Midwest Regional Sustainability Summit will explore new and promising areas of environmental sustainability, while also taking a deeper look at the issue of equity. They explore why equity is often overlooked in the discussion around sustainability, and the ways in which new economic opportunities can be pursued that are both socially and environmentally just. The Eastern Conference for Workplace Democracy (ECWD) exposes people to the concept of worker-owned businesses; strengthens existing worker-owned businesses; develops relationships between democratically-owned businesses, labor institutions, and resource organizations; and builds the movement for workplace democracy. It is held every two years in the Eastern United States. Come to the Weekly May meetings on May 2nd, 9th, 16th, 23rd, & 30th! Please join us for “An Introduction to Business Succession Planning," a workshop for small business employers who want to begin to develop their exit strategy. The training will be led by Chris Cooper of Kent State University's business succession planning program and the Ohio Employee Ownership Center. Don't miss our exciting residential solar workshop! Meet solar experts. Find out if your roof is a good fit for solar. Talk to residents who have installed solar. Meet local installers. SolarizeCincy needs your help.